Sen. Rand Paul Stages 'Filibuster' To Protest Patriot Act : The Two-Way The Kentucky senator and presidential candidate opposes the collection of bulk telephone data and other surveillance measures that the government says are needed to combat terrorism. 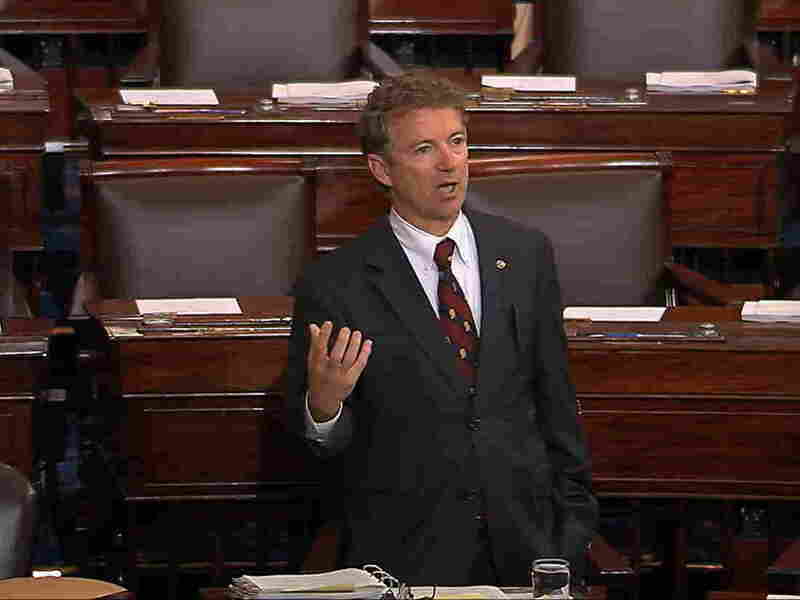 In an image from Senate video, presidential candidate Sen. Rand Paul speaks on the floor of the U.S. Senate Wednesday afternoon at the start of an almost 11-hour speech opposing renewal of the Patriot Act. Protesting the soon-to-expire Patriot Act, presidential candidate Sen. Rand Paul held the floor of the Senate for nearly 11 hours late Wednesday in a filibuster-like speech railing against the law and the government's continued surveillance of Americans' phone records. As NPR's Ailsa Chang reports, the Senate is expected to vote this week on a House-passed bill that would prevent the government from collecting and storing phone records, but it would let the government get that data from phone companies with a court order. Paul opposes that bill or any plan that would continue surveillance of phone records. Paul said the Patriot Act "isn't about the vast majority of good people who work in government. It's about preventing the bad apple — it's about preventing the one bad person that might get into government and decide to abuse the rights of individuals." Congress has until June 1 to renew the law without it lapsing; Paul's "filibuster" is unlikely to do more than possibly delay its passage in the Senate. The Associated Press says he finished at 11:49 p.m., having held the podium for nearly 11 hours. "Rand Paul was holding the floor for an extended period. But it wasn't a filibuster because it was not blocking consideration of the Patriot Act renewal (House or Senate version), nor was it really delaying it in any meaningful way. He did yield for questions — which that were really speeches by other members, including Democrats like Ron Wyden of Oregon and Martin Heinrich of New Mexico — that gave him a breather now and then. It took the form of a brief filibuster, but it was really just a long speech intended to attract attention. "A real filibuster has to have at least a chance of blocking or delaying consideration of a bill. No one does this physically anymore. It's done as a threat to filibuster, which translates into a delay (of varying length) or the scheduling of a cloture vote. In this latter, 'virtual filibuster' form, the tactic has become quite common — even normative — on anything important." The AP says Paul's fellow Kentuckian, Senate Majority Leader Mitch McConnell, has said the Senate will move on the Patriot Act before the Memorial Day recess.